Features Hot and Cold Pressure water (hot from Califont), 12 volt fridge and Freezer, TV/DVD, Island Double berth in Stbd hull + shower and toilet. 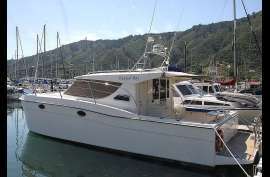 single and double berth in Port hull, Enclosed Cockpit head and shower, Windscreen Covers and Fore deck squab, 2 x 12 volt start batteries and 4 x 12 volt house batteries, Shore power with current E.W.O.F, 2.5 KVA inverter, Deck Wash, Easy walk around side decks . Large cockpit with flexiteak decking, Cockpit sink and bait station, Aft boarding platform with walk thru and boarding ladder.